While the news industry today continues to shift from bustling offices to laptops in coffee shops, it may be hard to imagine that the publishing industry was at the epicenter of some of the world’s most important architectural feats. 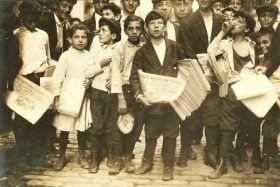 But this was the case in late 19th century New York City, when the daily newspaper industry was centered at Park Row, near City Hall. Such institutions included The New York Times, The New York Tribune and The New York World.